BKR Pros is a leading residential, industrial and commercial remodeling company with affiliates in Charlotte. We have more than 20 years experience in all phases of remodeling and specialize in custom shower and bathroom renovations. We stay current with trends and use the best in technology keeping us on the cutting edge of the cutting, removal, and remodeling industry. We have partnered with one of the best roofers in the Charlotte area to now offer installation as well. It's tempting to squeeze bathrooms into spaces not much larger than a phone booth. What can be forgotten amid all the squeezing and creative layout planning is the human factor - the need, that is, for human elbows, knees, hips, shoulders, and heads to be able to move freely and comfortably within the allotted space. We see this all the time in most bathrooms and homes. The doorway should be 32 inches wide and walkways should be at least 36 inches wide. Plan a minimum of 15 inches from the sink's center to any side wall. To make tasks such as washing hair more comfortable when in the shower, allow 18 inches on each side. If you install two sinks in the same counter, allow 30 inches, centerline to centerline, between them. Allow at least 8 inches between the edge of a sink and a counter. Plumbing Considerations: When placing fixtures in your bathroom layout, think about how they're used and in what order. The sink, for example, should be positioned closest to the door, because it's the last stop in most shower and bathroom routines. Having to squeeze by other fixtures on your way in an out of the door can be inconvenient. The toilet, tub, and shower can be farther from the door and enclosed in separate compartments for greater privacy, if you wish. 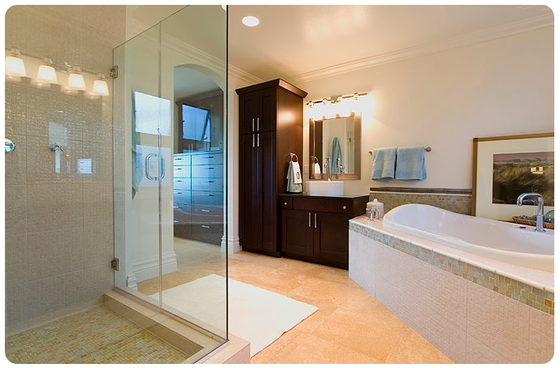 How many "wet walls" or walls that contain plumbing (including a stand-up shower) will there be in your bathroom? The fewer wet walls you have, the less costly your plumbing bill will be. One-wall layouts, with fixtures arranged along a single wall, are the simplest and require the fewest plumbing fittings. Keep in mind, however, that design and remodeling possibilities are limited with a one-wall layout. However, our professional remodelers are here to assist and are standing by to help.